Writers are always looking for something that makes their lives easier. The thing everyone raves about the most at the moment is Scrivener. I tried it. I don’t get it. I didn’t just get the free download, I bought it when they had it at half price on Amazon. I was going to take a class about it when a writers’ group offered it locally. But there was a blizzard and I missed out. I am no good at online tutorials. So maybe another class will come along and I will finally understand what everyone is raving about. Mind you, there are things about it I like. The corkboard and the index cards appeal to me. Because I have scenes occur to me or snippets of a conversation. When I am not actually sitting there writing. I used to jot them in a notebook. Or if in front of the computer, on a Post-it note on my desktop. Then I gather all those things together when I sit down to write. (I’m very disorganized. No nicely planned outlines here.) So using that one little part of Scrivener hardly made it worth my while. And it isn’t as easy as notes on paper. It is perfect for nonlinear thinkers such as myself. 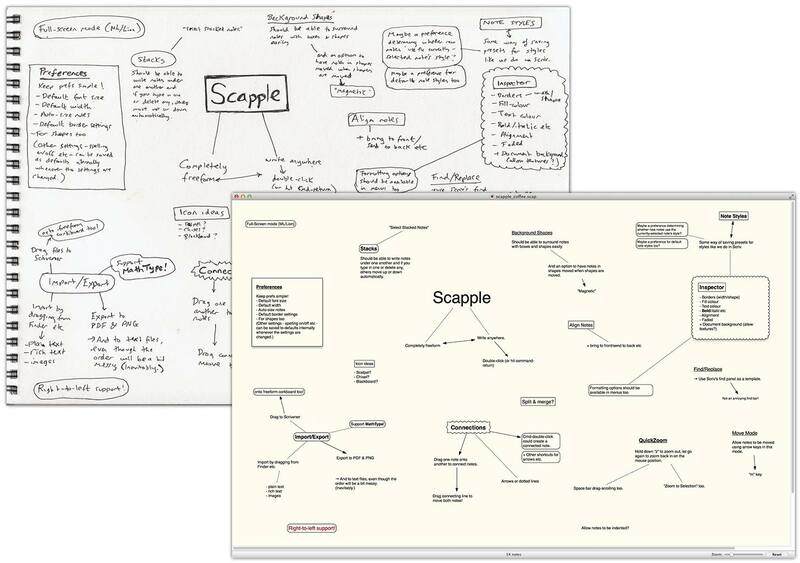 And if I ever do learn to use Scrivener, I understand you can just drag your notes into it. But for now, I am very happy with Scapple. There is a free 30 day trial – I knew after one day that I wanted it. And that is 30 days of use, not 30 calendar days. Use it today, one day. Don’t use it again for a week, day two. So you’ve nothing to lose and plenty of time to try. Of course I am still waiting to have a chip installed to capture my ideas and then download them when I need them!!! This entry was posted on October 13, 2013, in Rants Raves and Reflections, Uncategorized, Writing. Bookmark the permalink.